You’ve found the perfect partner now it’s time to plan the perfect wedding. Brides & Beyond would like to make sure that only the best suppliers in the industry are made available to couples in preparing for their walk down the aisle. What separates Brides and Beyond from all the other fairs is that the suppliers are all hand –picked and what’s cool is that the biggest names in the industry who don’t normally join fairs are in this one! Moreover, Brides & Beyond’s My Dream Wedding contest will be choosing a handful of lucky couples via Instagram who will get a chance to win wedding packages from our much-coveted sponsors – Team Pat Dy, Jason Magbanua, Nelwin Uy, Spruce Floral Designs, Madge Lejano, Rita Neri Event Planners, R Space and Boys Night Out. 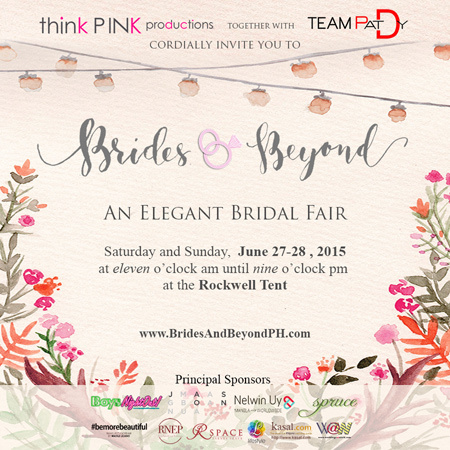 The 4th Brides & Beyond is on June 27-28, 2015, Saturday-Sunday, 11am-9pm at The Rockwell Tent, Makati. All suppliers will be giving special discounts and raffle prizes exclusive for the 2-day affair. Tickets may be purchased at the event entrance. The team would like to help you assemble the perfect wedding team that you’ll surely love, honor, and cherish even long after your wedding is over. Contact us at (63917) 877-8252. Visit www.bridesandbeyond.com and http://www.facebook.com/bridesandbeyondph for more details. Follow us on Instagram @bridesandbeyondph for updates and promos.